But do you actually know what water weight really is? Many people don’t, so we wanted to clear up some of the confusion. That’s why we went to the experts and got the “skinny” on this often-confusing barrier to weight loss. Debunking the Rumor: Is Water Weight Real? First of all, it’s important to remember that there is such a thing as chronic water retention. This is a serious medical condition in which your kidneys or hormones are malfunctioning for some reason, and it’s making your body retain water in an abnormal way. When we speak about “water weight” in this article, we’re essentially talking about bloating, which occurs sporadically and is affected by things like how much water you drank yesterday, or how much sodium you’ve been taking in over the last few days. Water weight can also be triggered by exercise or lack thereof; a sedentary lifestyle tends to make you retain more water weight. Essentially, water weight is real … while it lasts. And it may only last for 1 to 3 days. As opposed to weight from your muscles and fat, water weight tends to be stored in all parts of your body. For example, it may lurk in between your blood vessels, in your tissue, or in your extremities (your lower legs, toes, or fingers). Why Does Your Body Retain Extra Water? Generally speaking, your kidneys decide how much water your body retains, and they’re always working to attain that perfect balance. This means that if your kidneys think you are in danger of not having enough water to support your bodily functions (in other words, if they sense you’re dehydrated), they will hold on to even more water. You may have noticed evidence of this. Think back to a day when you didn’t drink much water, didn’t exercise, and you had something like Chinese food or pizza for dinner — both of which typically contain high amounts of sodium. The next day, you may have felt extra bloated. Your pants might have fit a little tighter, and your fingers may have felt puffy. On the scale, you may have noticed an extra 1 to 5 pounds. This is water weight. The bad news is, it does affect how you feel and how much you weigh. The good news is, if you make a few lifestyle changes, you can get rid of it rather quickly and easily. For someone who’s not looking to lose a significant amount of weight, water weight shouldn’t pose too big of a threat. It will always be going up and down to a certain extent, and as long as it doesn’t bother you and you don’t get too far out of your healthy weight range, it shouldn’t be a big deal. If, however, water weight makes you feel uncomfortable and is an annoying problem or you want to lose more than 5 pounds, you’ll need to make some lifestyle changes. Before discussing these, however, let’s look more closely at how water weight is different from fat and muscle weight. To ultimately lose more than 5 pounds, you’ll essentially need to “get through” water weight first. And it will be easy (more on that below). The bad news here is that after you lose the water weight, it will be much more difficult to lose fat. That’s because again, water weight fluctuates on a daily basis and is mostly affected by how much sodium, water, and alcohol you take in. 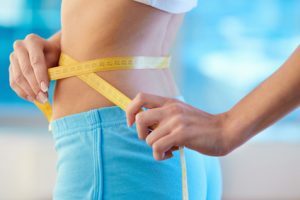 To lose actual stored fat, you’ll need to restrict your calories and create a calorie deficit so that your body can no longer get its energy from the food you eat and is forced to use up stored fat. Drink more water. Experts recommend drinking eight 8-ounce glasses each day. Drink less alcohol as it acts as a diuretic. Sweat. You should be exercising daily. If you only make these simple changes in your lifestyle, you’ll lose water weight in a day or two — or at the most – a week. It can be a great way to feel more comfortable on a daily basis, or to kick off significant weight loss.